Ephemeral mapping of the Colorado - Wyoming region. Map of Kansas, Nebraska and Colorado, Showing also the Southern portion of Dacotah. 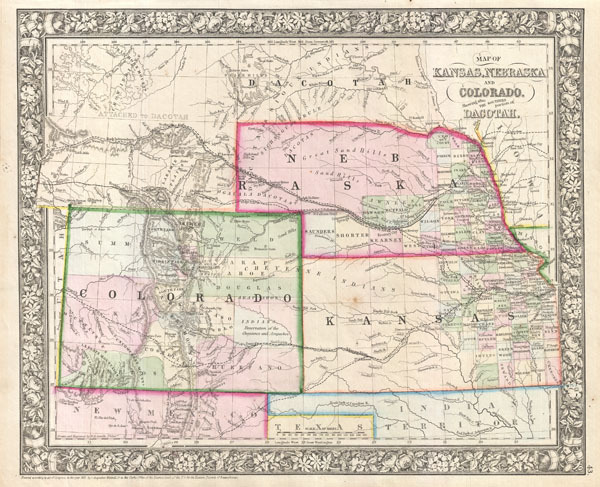 A beautiful example of S. A. Mitchell Junior's 1866 map of Kansas, Nebraska, Colorado and Dakota. Wyoming, though territorially included, was not incorporated as an official territory until 1868 - here it is noted as 'Attached to Dacotah.' Color coded according to county and territory. Counties cover only the eastern and southern portions of Nebraska and the eastern third of Kansas. Shows various proposed railroads, geographic features, American Indian tribes, and gold deposits as well as providing details on towns, counties, and other political data. This map did not appear in the 1860 first edition of Mitchell's New General Atlas. Rather, it was introduced in 1861 following the formation of Colorado territory. The 1859 Colorado gold rush precipitated rapid development of the region by countless settlers seeking a new life and opportunities in the American 'wild west.' Identifies several overland routes including the former Pony Express Route (along the North Platte River), the Gunnison route o 1853, and the Santa Fe Trail leading into New Mexico. One of the most interesting and ephemeral maps of this transitional region to appear in the mid 19th century. Very good. Blank on verso. Minor fox mark in western Kansas. Phillips (Atlases) 831. Wheat, Mapping of the Transmississippi West … , 1030.